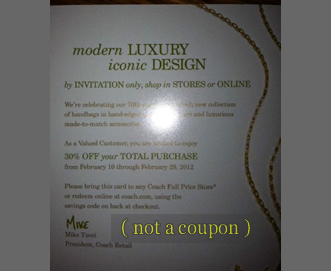 I just stumbled across this very unique deal, it’s a coupon for Coach 30 Percent Off Entire Purchase. It doesn’t matter what you buy, combine your purchases in one order and Coach will give you 30% off entire full price purchase with this coupon. Taxes and shipping charges not included in discount total. The coupon is not valid at Coach Factory stores, department stores or airport locations but it is good at all Coach stores in the United States, Canada and Puerto Rico as well as online at Coach(dot)com. Unfortunately, it’s good for one time use only. 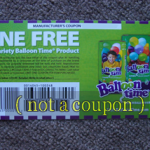 It says right on it that it is not valid on merchandise holds, phone orders or gift card purchases and there are no adjustments on previous purchases. 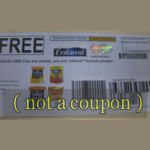 Like most all coupons it cannot be combined with any other offer or discounts. It is an amazing deal. You can add all your things you want to get and you can get this huge discount. There is not limit to the savings you can get. I love their classic design handbags. You can take it anywhere any time. Their shoes and wallets are so well crafted. They last forever. With next seasons fashions in mind you will want to stock up on getting more than one. 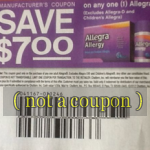 Now with this coupon you can afford to do that. 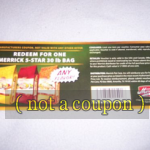 Remember this in not just a one item coupon. It is a coupon for Coach 30 Percent Off Entire Purchase ! Go crazy and get shopping now! You will save big bucks $$$. 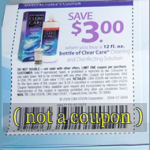 You gotta love coupons!! !